Doesn't it strike you as odd that your overhead door might make some strange sounds all of a sudden? Although we all attribute most noises to lack of lubrication, this is not always the case. When parts are not properly aligned, the door will make noises as it moves. Sometimes, it won't even close properly or it will open unevenly. 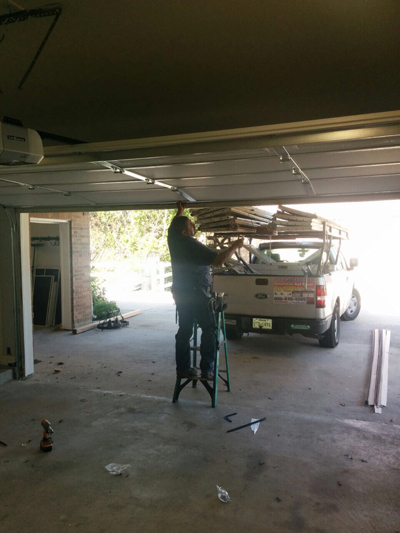 In the case of garage door opener sensors misalignment, the door's movement will also be dangerous. Even if your safety is not endangered, a malfunctioning door will still create security problems. Why go through that? Making adjustments is critical so that the door can operate properly at all times. Did you check the sensors lately? Why do garage door parts get misaligned? It might be due to daily use or because some fasteners got loose. The sensors might be accidentally hit by the car and some track bolts might loosen up due to the vibrations. When garage door tracks get misaligned, the vibrations get worse. There is a possibility that the door will jam since the rollers won't be able to slide into the tracks properly. This can be fixed by bringing the misaligned track in its original position before tightening the screws. Things are more difficult when springs start to sag. Spring power enables the proper lifting of the door. If they are loose, the door won't open with ease. If they are too tight, the door might not close all the way. Adjustments need perfection. As a matter of fact, torsion and extension garage door springs are adjusted differently. For the latter, all it takes is moving the cable hook either further from the door or closer to it. When it comes to torsion springs, you must use the right winding bar to release or add tension. The door won't reach its full closing or opening position if the settings at the opener unit are not proper either. The buttons, which are in charge of the travel limit, must be turned till the door closes and opens well. The UP button is used when the door doesn't open all the way and the DOWN button is turned on when the door doesn't close well. Sensor adjustment is equally crucial! If the sensors do not face each other, the reverse system won't work efficiently. The photo eyes won't sense your car passing through and most importantly - a child running under the closing door and that will increase the risk for tragic accidents. So, make adjustments your priority, and avoid hassle and safety hazards.